Pay negotiations between the higher education trade unions (UNISON, UCU, Unite, GMB and EIS) and the employers (via their negotiating body the Universities and Colleges Employers Association, UCEA) have concluded. 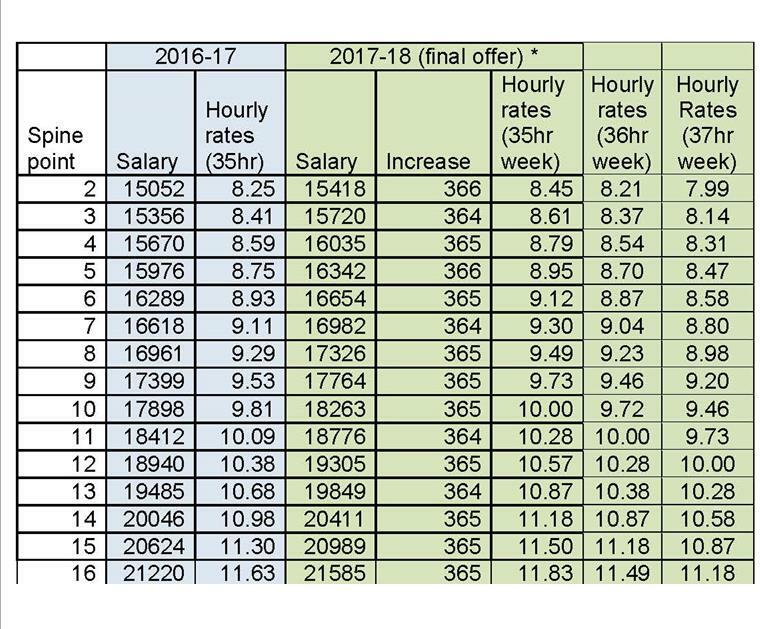 The full and final offer tabled by UCEA on 27 April 2017 is a 1.7% increase on all points on the pay spine, with additional payments for those at the lower end as tabled below. This is effective from August 2017. UNISON’s Higher Education Service Group Executive (HESGE) decided at its meeting on 4 May 2017 that this offer is the best to be achieved by negotiation, and that if members vote to reject the offer, sustained and prolonged industrial action would be required. In line with UNISON policy, the final offer is first of all subject to a Branch consultation exercise, which will end on 3 July 2017. This Branch will therefore be putting in place arrangements to consult with members in order to report back to HESGE, and so please look out for further communications and information. If, based on the results of this consultation, HESGE decides on a course of action including industrial action, then this would be put to members in a further, centrally conducted, ballot. In accordance with the Trade Union Act, a turnout of at least 40% would be required in order to make a vote for industrial action legally valid. Rejection of the pay offer in an industrial action ballot would initiate a campaign of industrial action in line with UNISON rules and conference policy. UNISON would endeavour to work alongside other unions wherever possible on joint action.